Home Our Business Testimonials Thank you, thank you! I HAVE just returned from singing the Mozart Requiem in Granada with Coral Coraxalia and I am now relaxing reading the Euro Weekly with my feet up. I have just seen the article about my art exhibition on page 13. Absolutely fantastic and I’m so delighted you have given over such a large space for it. Also, the story for the Coral Coraxalia choir. So kind of you and the promotion must have worked because the concert was a sell out! It was magnificent – four choirs performed three songs each before the joint choirs performed the Mozart. A music critic in the audience described it as a Susan Boyle moment when we performed our slot. The mostly Spanish audience were probably not expecting the mostly retired international ex-pats to be able to compete with the youngsters in the other choirs, but we excelled, judging by the cheers and what seemed endless standing ovation. We have worked so hard and our choir director, Eusebio Pita is still ‘en las nubes’ at our performance. 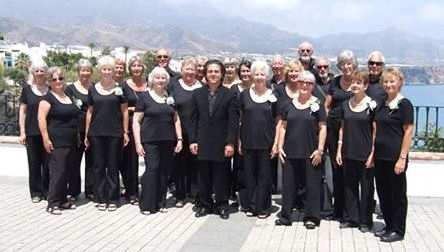 The hugs and kisses, and tears of emotion by both women, and men – even Eusebio – our ‘Gareth Malone’ of the Axarquia. What a wonderful choir we have, thanks to him. We are still inviting people to join us and they can find our more on our website: www.coralcoraxalia.com.